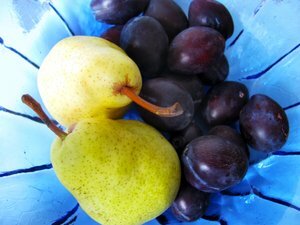 Combine pears and plums in a medium pan over low heat. Cook until the fruit begins to break down and soften, about 5-10 minutes. Cool. Blend or mash the pears and plums. Fill small cups with the mixture and insert a popsicle stick. Freeze for a quick and easy treat.